MARBLE FALLS — Right up front, you don’t need any running, swimming, or biking experience to help ensure the 18th annual Marble Falls Triathlon enjoys another successful year. “You just have to want to help out,” said race director Mario Gonzales. The Marble Falls Triathlon is Sunday, July 15, starting at Lakeside Park, 307 Buena Vista Drive. The event features legs in swimming, cycling, and running before finishing up at Falls Creek Park, just across Buena Vista Drive from Lakeside Park. The race starts at 7 a.m. with waves taking off at staggered times. Most of the competitors are back by noon. Volunteers are needed to help participants check in, work water stations along the race course, and lots more. The three legs of the race need plenty of volunteers to help before, during, and after the event. Gonzales and organizers will work to make sure volunteers are assigned tasks they are comfortable handling. They’ll also provide all the training necessary to prepare you in advance. Over the years, a core of volunteers have returned event after event to help, but there’s always room for more. Since he started the Marble Falls Triathlon 18 years ago, Gonzales has seen the event draw thousands of people to the area as they experience what he knew then was the perfect setting for a three-discipline event. Lake Marble Falls with Lakeside Park provides the perfect “stadium” venue for spectators and fans. Gonzalez and Roger Soler, who helped in the early years, scouted out an “out-and-back” 23-mile bicycle course down U.S. 281 and Texas 71 west before tacking on the 4.4-mile run through the Pecan Valley area of Marble Falls. The swim covers 1 kilometer. The course drew competitors from all levels, and they all raved about the setup. The one thing that has really made the Marble Falls Triathlon a success, however, has been the volunteers. “The volunteers really make this race happen as well as it does,” Gonzales said. Though he has a handful of “core” volunteers, he’s always looking for a few more. Several of his regular volunteers had no triathlon experience whatsoever when they started helping. A few have actually gone on to compete in triathlons — including the Marble Falls event — themselves. Go to marblefallstri.com for more information on how to volunteer or register for the race. For other ways to help in the community, check out the Highland Lakes Volunteer Guide. 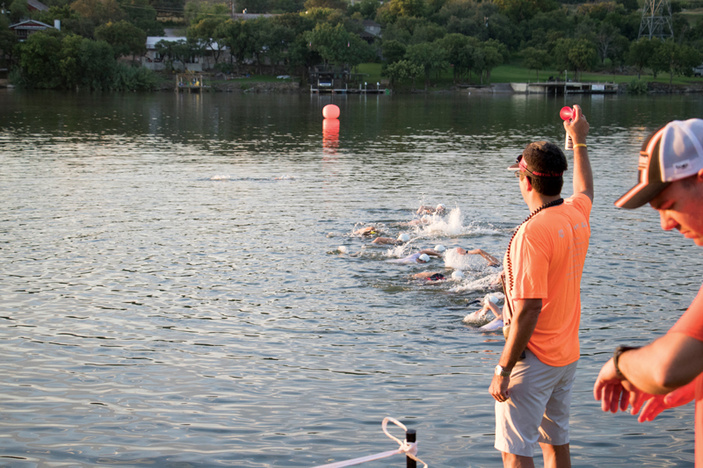 See more competitive events such as this in the Highland Lakes Races guide.